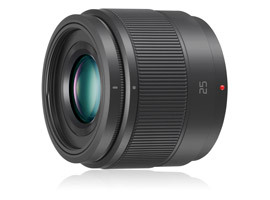 The Panasonic LUMIX G 25mm F1.7 ASPH is a fast, compact, and lightweight prime lens. It has a bright f/1.7 maximum aperture that allows for shooting low-light scenes and offers additional depth-of-field control over slower kit zooms. 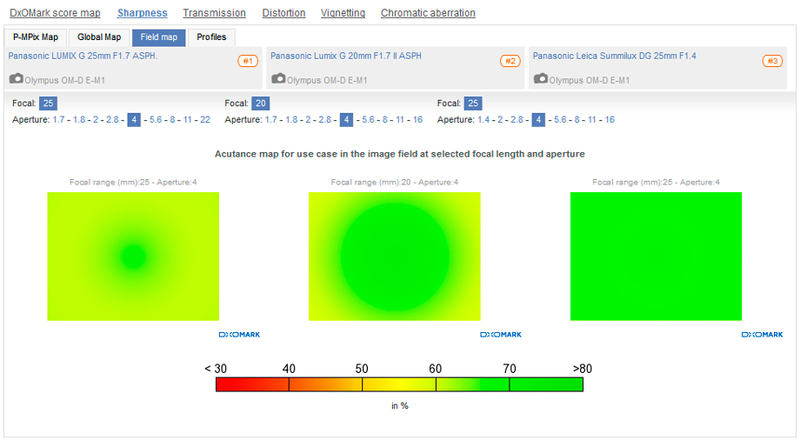 Lens construction consists ofeight elements in seven groups, including two aspherical lenses to reduce chromatic and spherical aberrations for increased sharpness and clarity. The company says the optical formula also includes one ultra-high refraction (UHR) element that helps produce even illumination and sharpness for consistent performance throughout the aperture range. It achieves an attractive and smooth out-of-focus effect when working with shallow depth of field due to the rounded seven-blade diaphragm. If you shoot videos, you’ll find that the stepping motor delivers fast, smooth, and near-silent autofocus operation. 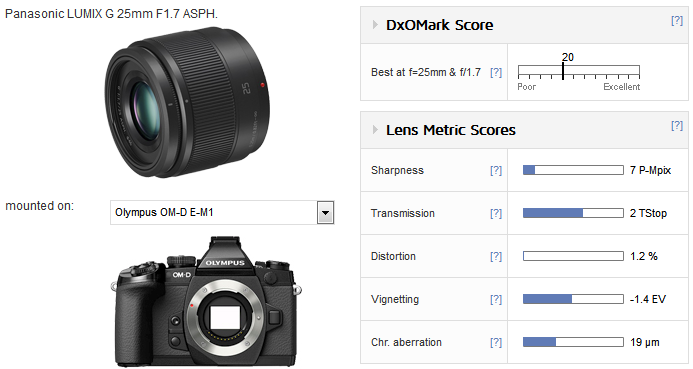 The new Panasonic LUMIX G 25 mm F1.7 ASPH focuses to 9.84’ (25cm) and measures 2.39” x 2.05” (60.8 x 52 mm). It weighs 4.41 oz (125g) and is available now for $300.00 (USD). 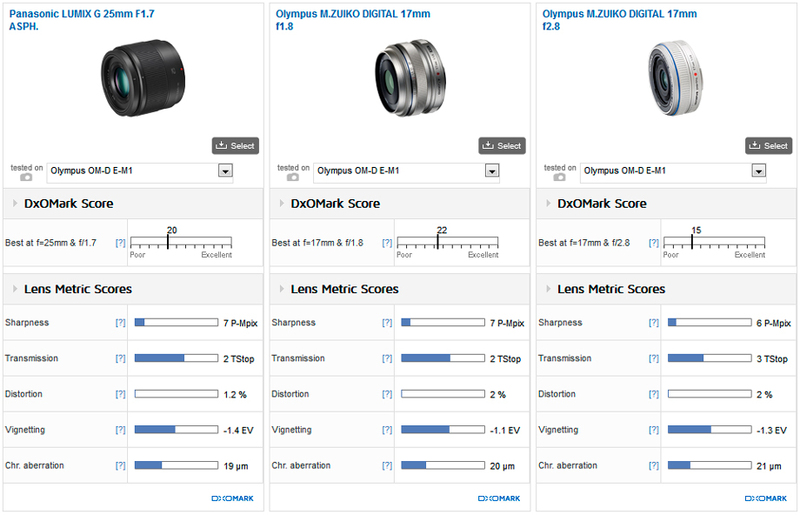 With a DxO Mark lens score of 20 points and a peak sharpness of 7 P-Mpix on the Olympus OM-D E-M1, a 16-Mpix model without an AA filter, the Panasonic Lumix G 25mm F1.7 ASPH is a solid performer. However while uniformity is quite good, sharpness levels are generally low. It also has slightly higher than expected barrel distortion for a lens like this. Still, that is simple to correct with software, and most if not all current Panasonic and high-end Olympus bodies correct distortion in-camera, so it’s likely to be much less pronounced on final RGB images. 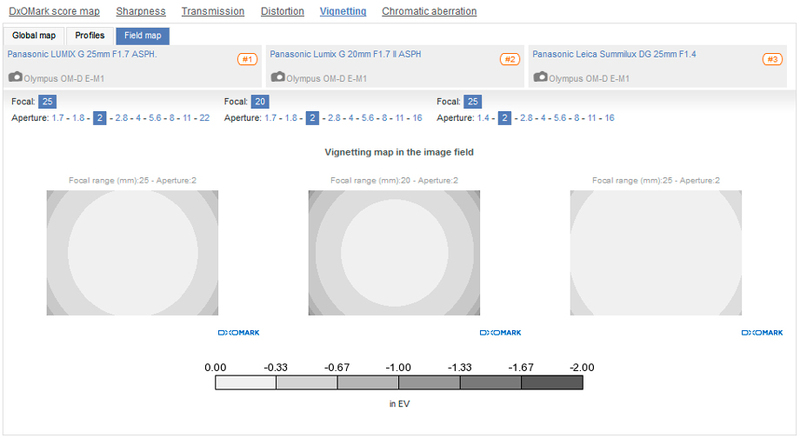 Vignetting, however, while low at -1.4 EV (maximum), is actually quite noticeable. But it, along with the relatively high chromatic aberration at 19 microns, is likely to be much less of an issue after in-camera processing or correction with software. It has relatively good transmission at T2. 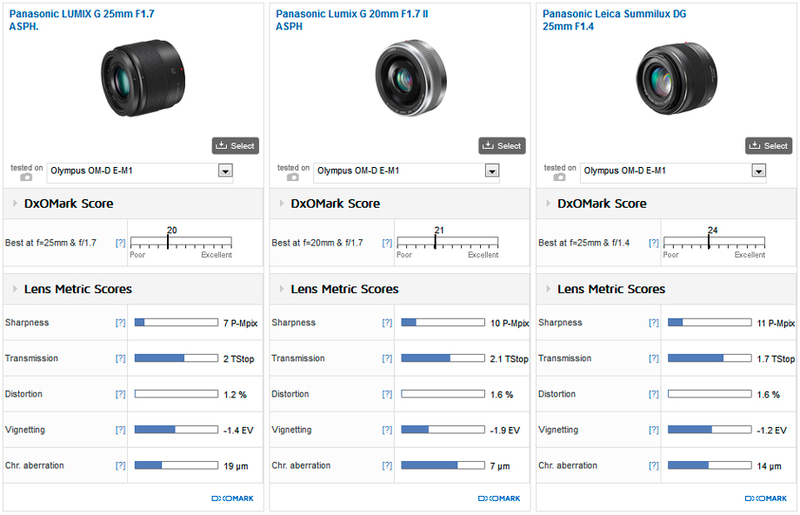 The Panasonic Lumix G 25mm F1.7 ASPH tested here is the newest in this lineup, having been announced in September 2015. It compares reasonably well overall against the Panasonic Lumix G 20mm F1.7 II ASPH (announced in June 2013) and with the dual-branded Panasonic Leica Summilux DG 25mm F1.4 ASPH, the oldest of this group, announced in June 2011. However, the new Lumix 25mm f1.7 it has notably lower sharpness levels and has high chromatic aberration, albeit restricted to the corners. All three models have soft borders wide open, but the 25mm has a larger central core of sharpness than the wide-open 20mm, and the Leica 25mm compares at f/1.4, which is one reason the Summilux costs what it does. In fact, there’s no question that the high-end Panasonic Leica Summilux DG 25mm F1.4 is the best of the bunch. 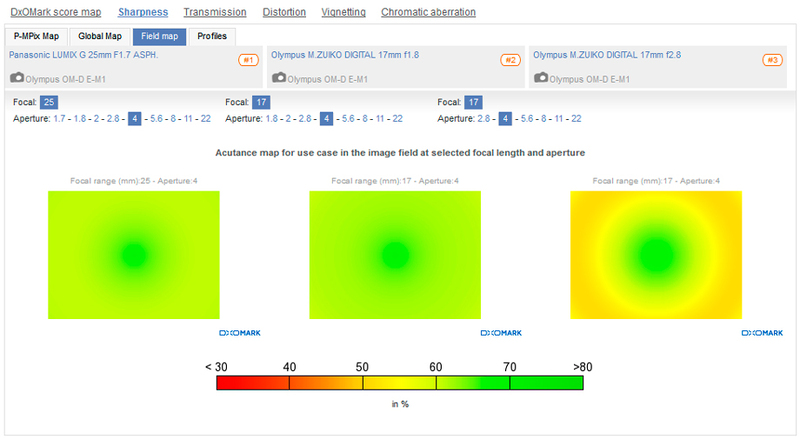 The lens is sharper at f/2 and has excellent uniformity and superior edge-to-edge sharpness from f/2.8 down to f/5.6-8.0, albeit where the effects of diffraction can be seen. Compared with the 20mm pancake, the 25mm f1.7 has better uniformity when stopped down, but it simply can’t compete with the pancake’s high central sharpness and low chromatic aberration. Things may improve with in-camera processing or with software, but the lower sharpness is somewhat disappointing. We’ve yet to put the 25mm models to the test, but pitched against the two M.Zuiko Digital 17mm (35mm equivalent) models from Olympus, the Panasonic Lumix 20mm f1.7 fares quite well. Against the high-end Olympus 17mm f1.8, the Panasonic is close wide-open in terms of sharpness; however (perhaps unsurprisingly), the M. Zuiko has better uniformity and is sharper in the outer field. At f/2.8, the two are evenly matched and both outperform the 17mm pancake at that aperture. At f/4-5.6, the Panasonic performs similarly to the 17mm f1.8 albeit for different reasons. If it weren’t for the Panasonic’s astigmatism, sharpness in the outer field would be greatly improved. Still, the 25mm is an improvement on the similarly-priced 17mm f2.8. The Panasonic has lower distortion, of course, but that’s expected, and all three suffer from high levels of chromatic aberration. This said, the profiles differ greatly between the two makes. Fortunately, the fringing seen in the Panasonic is restricted to the extreme corners, while the Olympus models have a much more troublesome ring mid-field. 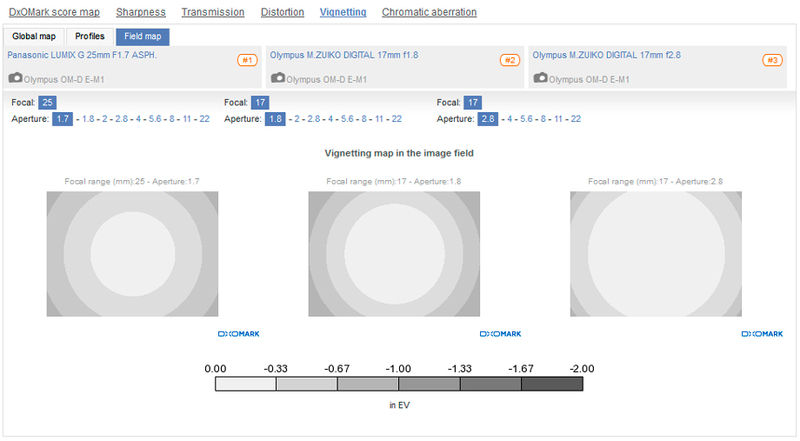 And although the measured vignetting seems to favor the Olympus models in the table (above), the Panasonic isn’t that far behind the Olympus 17mm f1.8. One of the benefits of buying into the Micro-Four-Thirds system is the expansive range of lenses on offer; however, if you were looking for a standard 50mm equivalent lens, it was limited to a rather pricey 25mm f1.4 model. The Panasonic 25mm f1.7 is moderately fast and at around $300, fits into the Panasonic lineup quite well (we’ve yet to test the new 25mm f/1.8 from Olympus). 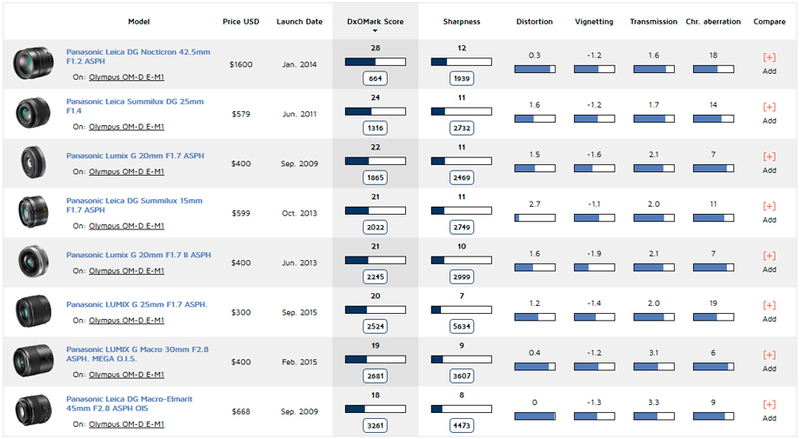 That’s around $100 under the well-liked 20mm f1.7 pancake and around $280 beneath the pricey dual-branded 25mm f1.4. Although it performs quite, well it doesn’t really stand out. And there are some concessions, most notably in sharpness. While experienced photographers know sharpness isn’t everything in a lens, it feels like a somewhat retrograde step. Nevertheless, as a model intended to entice users to upgrade from a kit zoom, it is an attractive option.